I was reading a book, "the history of glue" - I couldn't put it down. Come get your advance copy of Good Pirate, winner of the Rainforest of Reading award, signed at the Pajama Press booth! See the publicity flyer. Join your children’s bookselling colleagues! Taking full advantage of our schedule immediately preceding ALA’s annual conference and close proximity to Disney World, ABC Group is actively planning a hefty program of keynote and featured talks, breakout education sessions, round-table discussions, an author reception, a rep picks speed dating lunch, and Scholastic Meet & Treat After Party. The event was a success! Here’s a picture from Bob McNicoll’s facebook page. First presented in 2005, the Arts Awards increase the visibility of St. Catharines’ artists and cultural industries, honour cultural leaders and their achievements, and cultivate financial and volunteer support for the arts sector. Arts Award recipients to date demonstrate St. Catharines’ breadth of talent and commitment to the arts. The arts groove is on at the 2016 St. Catharines Arts Awards, with a night of performances, awards and local celebration! St. Catharines celebrates excellence in all areas of artistic creation and contribution, honouring local artists and cultural leaders and their achievements with awards handed out in 6 categories. See more at www.stcatharines.ca/en/livein/ArtsAwards.asp. P.S. I won!! See stcatharinesstandard.ca/2016/06/05/st-catharines-arts-awards-recipients-announced. Kari-Lynn Winters is one of five artists nominated in the Emerging Artist Award category of the St. Catharines Arts Awards. ST. CATHARINES — If Kari-Lynn Winters wasn’t able to write, she just wouldn’t feel right. associate professor teaching drama and education at Brock University, she spends three hours writing. She’s been doing that for 10 years, since before she published her first illustrated book for children. Now, 16 published books later, she keeps up with the habit. “It’s all about discipline,” she said. It’s not just children’s books she publishes, Winters is also a playwright. She finds joy in creating new worlds and telling unique stories in interesting ways. 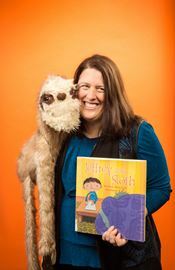 A teacher at heart, she tries to infuse educational elements in all of her work — like her book of poetry Hungry for Math: Poems to Munch On and the informational interactive activity book Bite Into Bloodsuckers, all about insects. Winters is one of five St. Catharines artists nominated in the emerging artist category, recognizing and celebrating their current accomplishments and their future potential. While the artists are all varied in their approach, the one thing they have in common is passion. While Winters is an author and playwright, the other four nominees are all musicians: folk singer songwriter Whitney Pea has been performing across the region and beyond as part of a full band and as a solo artist, Beth Moore’s music makes regular appearances on CBC Radio as she carves out a career for herself on the national stage, Charlotte Knight is making a name for herself in Canada’s opera scene with regular musical theatre performances, and Aaron Berger incorporates his inspiring story of overcoming mental health challenges into his musical performances. Berger, Moore and Knight will all be performing during the award ceremony, along with a performance by NSO Music Director and established artist award nominee Bradley Thachuk with members of the Niagara Symphony Orchestra. In total, 19 artists are up for awards in five categories. In addition to Emerging Artist, other awards handed out that night will include Established Artist, Arts in Education, Making a Difference, and Patron of the Arts. Past Arts Award recipients Deb Slade and Mike Enns will be the emcees at the event. The awards will be handed out Saturday night during a ceremony taking place at Cairns Recital Hall in the FirstOntario Performing Arts Centre. The event kicks off at 8 p.m. Tickets for the evening are still available for purchase. They are $12 in advance or $17 on event day, plus applicable fees and taxes. Tickets are available through the FirstOntario Performing Arts Centre Box Office online at firstontarioPAC.ca or by calling 1-855-515-0722. Following the awards event, there will be an after party at Mahtay Cafe and Lounge on St. Paul Street. For more information on the St. Catharines Arts Awards, visit www.stcatharines.ca/artsawards. Presenting in the workshop “Living through the Body: Perceptions and Embodied Literacies” along with Christine Boyko-Head (Mohawk College) and Helen Zdriluk (Brock). Rainforest of Reading in St. Lucia – with TWO books! We’re cultivating deep roots for literacy and lifelong learning. The festival is the largest literacy initiative ever undertaken in a region still reeling from infrastructure damage caused by recent hurricanes, and the economic impact of a global recession. We offer children an opportunity to envision a world of possibilities beyond the four walls of their classroom. To help them record their thoughts and opinions of each title, every student receives their very own Rainforest “passport”. The books become school property, but students keep their passports as a real travel document – a genuine connection to the power of literacy. As they journey through The Rainforest of Reading, they earn sticker-stamps for every book read! All readers – but especially reluctant ones– become part of something very special. See more about my involvement with Bad Pirate and Hungry for Math (2016 festival), and Gift Days (last year’s 2015 festival). This 45 minute informative and fun presentation / workshop is for graduate students in all stages of their research. Social attendees are encouraged to bring samples of their research / writing. Leading a Writing Workshop in L.A.! Join Access Books for a day of workshops on topics like comedy writing, character development, and storytelling through rap, poetry, images and more. This year’s star-studded lineup includes Taye Diggs (How Stella Got Her Groove Back, Chicago, author: Mixed Me! and Chocolate Me! ),Shane W. Evans (Coretta Scott King award-winning illustrator whose credits include Mixed Me!, Chocolate Me, We March, and more), screenwriters Gabe Sachs and Jeff Judah (Diary of a Wimpy Kid, Freaks and Geeks), Adam Glendon Sidwell (Evertaster), Ava Dellaira (Love Letters to the Dead), Ky-Phong Tran, F.C. Shaw (Sherlock Academy), and Dr. Kari-Lynn Winters (Bad Pirate). See more info at eventbrite.com. The Word On The Street is a national celebration of literacy and the written word. On one extraordinary Sunday each September, in communities coast to coast, the public is invited to participate in hundreds of author events, presentations and workshops and to browse a marketplace that boasts the best selection of Canadian books and magazines you’ll find anywhere. See more at www.ellaminnow.ca and facebook.com/ella.minnow.books. Come celebrate the power of words to ignite our imaginations and perhaps even change the world on September 10, 12 and 13. This year’s festival includes three events, by turns entertaining, thought-provoking and inspiring. The Eden Mills Writers’ Festival has been hosting a literary picnic on the idyllic banks of the Eramosa River for over 25 years. The Festival is a nationally acclaimed literary event, treasured by book lovers and authors, and widely respected by Canada’s literary community. See more at edenmillswritersfestival.ca/2015/childrens-authors.html. On My Walk now a play at Carousel Theatre! What: Stage version of On My Walk for the wee ones! Next year come see the stage version, created by Marcie Nestman and Kari-Lynn Winters, based on the book On My Walk by Kari-Lynn Winters and illustrated by Christina Leist. For Newborns to age 3, and their families: Join Sonny and Breeze on their delightful adventures through the seasons as they sled, hike, swim and bike. Though friendships can sometimes be tough and sharing can sometimes be difficult, having each other makes it all worthwhile. This interactive, playful production invites very young children and their families to take part, clap, sing, and move together. See more at carouseltheatre.ca/production/on-my-walk-2. What: Presenting two workshops at “The Art of the Story” conference: “The Straight Scoop on Picture Books” and “Getting Your Act Together”. What an exciting opportunity!!!! our imagination, challenge our conceptions, unite us in universal narratives, and move us beyond words. From snappy beginnings to twisted endings, this hands-on workshop will look closely at the synergistic craft of picturebook authorship through examples, discussions, and performance. For children in Preschool through Grade 6, at Kate S. Durdan Public School and Loretto Catholic Elementary School. The Ontario Literacy Association Niagara (OLAN) is a local provincial chapter of the International Literacy Association. It is a professional organization of individuals devoted to enhancing the language and literacy experiences of individuals across the life span. Its goals are to enhance and improve the professional development of literacy educators, to improve the quality of literacy at all levels, to sponsor seminars and meetings planned to implement the purposes of ORA, and to promote mutual understanding and supportive participation among educators, community members, and parents concerning issues related to literacy.